The Chronicle introduced early Saturday morning a redesigned website to create a better overall user experience, launching new features such as a campus calendar. The Chronicle’s newly appointed Web developer Marcus Harun was mainly responsible for transitioning to the new website theme. The Chronicle’s campus calendar offers a way to find all university events aggregated into one calendar. Members of the Quinnipiac community can add their own events to the calendar and will be shared pending moderation by the Chronicle. 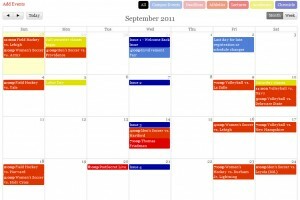 Easy-to-use filters allow users to choose which calendars they want to see individually. Another key new feature to the website is its multimedia page makeover. No longer will users have to leave QUChronicle.com to scroll through photo galleries. All multimedia produced by Chronicle photographers and videographers can be found on the site’s revamped multimedia page. The site also unveiled a newly designed local advertising media kit, which can be downloaded from the advertising page. The Chronicle expanded its advertising options for print and online, including rates for inserts, website banners and custom advertisement design.